SINGAPORE - The North-East Line extension will open in 2023 - seven years ahead of its expected opening date of 2030. The one-station extension will span about 1.6km. 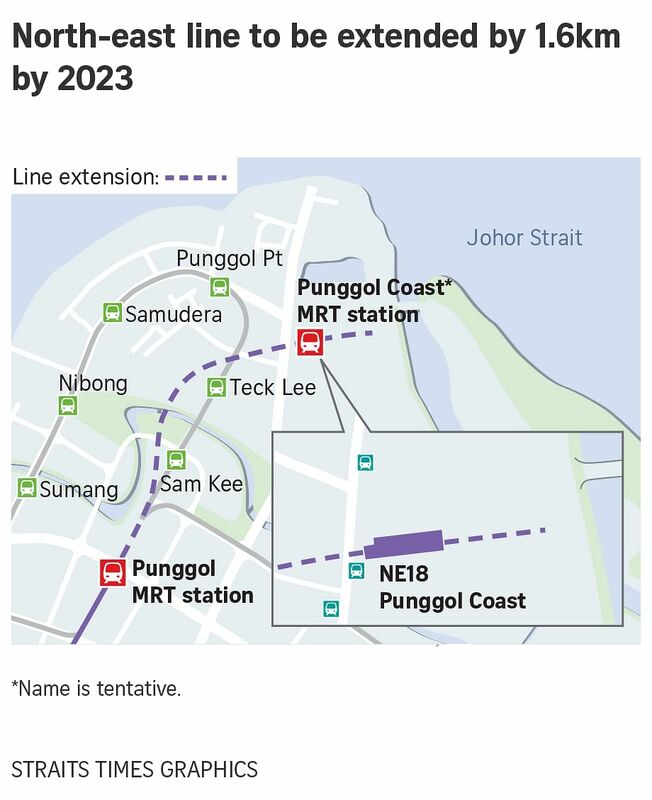 It will serve the Punggol North area and the station is likely to be called Punggol Coast station. Second Minister for Transport Ng Chee Meng announced this on Wednesday (June 7) at the Boon Lay station while visiting an exhibition about the Tuas West Extension on the East-West Line, which will open later this month (June). "This will benefit residents and students in the Punggol town area, especially in the northern part of Punggol," said Mr Ng. The Land Transport Authority had said earlier that the extension of the North-East Line will be built in tandem with the developments there so that future residents in Punggol North will have train access to the city centre as well as other parts of Singapore. Punggol North will be a mixed-used area and is slated to be an "enterprise district" housing digital and cyber-security industries. It will also be the first district where new planning concepts will be applied and a master developer - in Punggol North's case, the JTC Corporation - will be appointed to take charge of the entire district. The district will include the new Singapore Institute of Technology campus which will be located next to JTC's business parks. In response to feedback from commuters, the LTA said the new station will also incorporate more "open public spaces" where activities can be held, as well as a dedicated space to showcase exhibitions. "We envision the station to be a vibrant community hub that brings commuters together in the heart of Punggol North," said LTA deputy chief executive for public transport, policy and planning Jeremy Yap. The LTA will call tenders for the construction of the NEL extension this month (June), with construction expected to begin in the first half of next year (2018).